A post-Conquest manuscript, written in Normandy and amongst those presented to Durham Priory by William of St Calais. This work contains the commentary on the minor prophetic books of the Old Testament, written by St Jerome at the end of the 4th century. As usual the most useful provenance information is to be found at the head of the first page of text. Here we have the early 15th century inscription “Explanacio Jeronimi xij prophetarum . de communi libraria monachorum dunelm’”, telling us that the book was kept in the cloister library at that time. 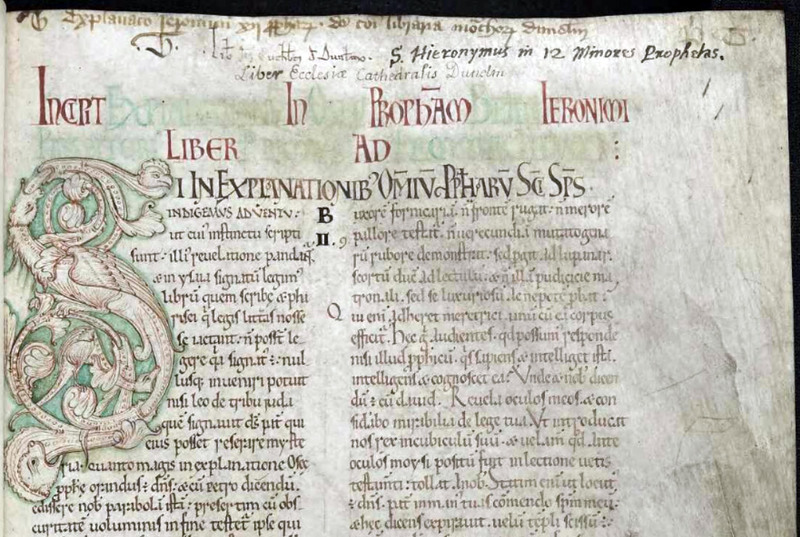 The inscription is preceded by a letter G that appears to have been altered to a T - in the late 14th century catalogue of the Cloister Library the shelfmark is G, but the later and fainter shelfmark in the top right corner is “Pi T”. The earliest inscription is on the second line, “Liber Sancti Cuthbertj de Dunelmo”. The other two inscriptions were written after the dissolution.